A report of a prediction rule for rebound hyperbilirubinemia (return of total serum bilirubin to phototherapy threshold within 72 hours of phototherapy termination) in newborns of at least 35 weeks’ gestation. Authors studied a group of ~7000 infants, 4.6% of whom had rebound hyperbilirubinemia. The formula is calculated as: 15 points if gestational age less than 38 weeks, minus 7 × (age in days at phototherapy initiation) minus 4 × (AAP phototherapy threshold − TSB at phototherapy termination) + 50. 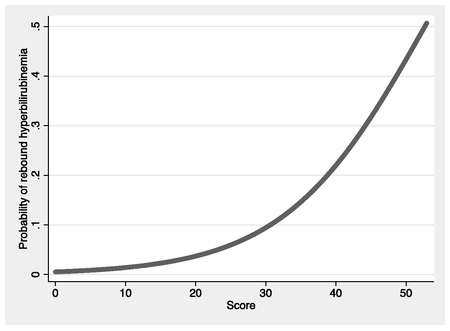 This score in turn can be applied to a curve (pictured) to predict rebound hyperbilirubinemia. Using claims data from the Alabama Children’s Health Insurance Program, calculated each of four quality measures under two alternative definitions: (1) the formal claims-based guidelines outlined in the CMS Technical Specifications, and (2) a broader definition of appropriate claims for identifying preventive service use. Concludes: Differences in CHIP design and structure, across states and over time, may limit the usefulness of select claims-based core measures for detecting disparities accurately (Medicare and Medicaid Research Review). An ICD-10 update of the pediatric complex chronic conditions (CCC) classification system from 2000. The system includes diagnostic and procedural codes that incorporate a new neonatal CCC category as well as domains of complexity arising from technology dependence or organ transplantation. Linked electronic supplementary material provides SAS and Stata code, plus tabular information on codes. A clinic at SickKids (Toronto) that provides a regular clinic for adolescent patients who require psychosocial and educational support to prepare for transition to adult care. 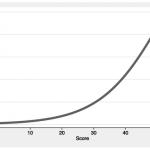 An evaluation of the telemedicine (vs. in-person) application of the Yale Observation Scale and the Respiratory Observation Checklist in febrile children age 2 to 36 months. ,as implemented via a telemedicine system. Strong agreement was found between bedside and telemedicine observers. Excellent agreement between bedside and telemedicine observers was found for the impression of respiratory distress.